Simple Seed Stitch Beanie Crochet Hat Pattern For Men, Women, and Kids in 4 Sizes! 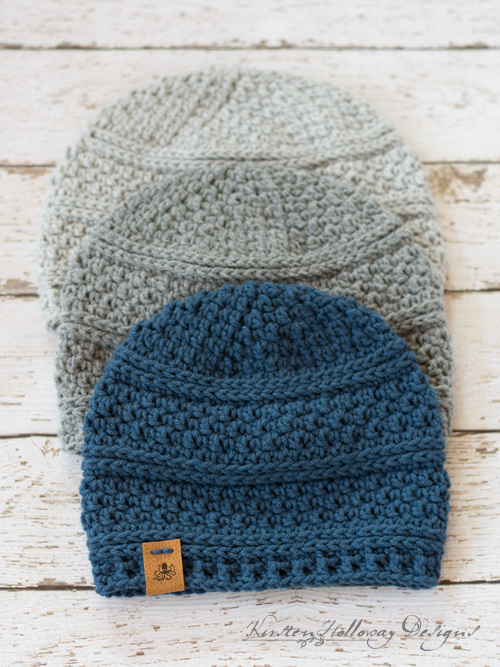 Keep the men in your home cozy this winter with a quick and easy to make seed stitch beanie! The seed stitch adds texture and warmth to the beanie, helping to protect heads of all sizes from winter winds. Because the seed stitch beanie is a quick and easy crochet project to work up it would be perfect for last minute Christmas gifts, or donating to charities that help the homeless and needy this winter. If you are familiar with the seed stitch, then you’ll have this pattern down in no time. If not, the concept of the Seed Stitch beanie is very simple: It alternates sc and dc stitches in one round, then dc, and sc stitches in the next, so that you’ll always have a dc worked into a sc sitch or vice-versa on the non-increasing rounds! Caron One Pound is some of the thickest, true worsted weight yarn available in Big Box craft stores and I love it for it’s warmth and stitch definition. These hats are plush, squeezably soft, and best of all it only takes 2 or 3 hours to crochet each one! This is a longer beanie that fits snugly over the ears. I’ve included gauge information to help you crochet it so it fits the proper way. You may add a leather, cork or wood tag to the hat as a personal touch. Check out All This Wood on Etsy for a variety of customizable options. Working in the 3rd Loop of hdc – Instructions: Look at the top of the stitch, and locate the sideways “V”, bend the stitch to look at the back*, and you should see another “V”. You’ll be working into the back loop of that “V”, this is called the 3rd loop. 13 hdc sts in 4”; hdc stitches should be 1/2” tall. Circle should measure 3 1/2” across after round 4, 4 1/4” after round 5, and 5” across after round 6. -First st of round should be made in the same st as join. -You will need to use a thicker worsted weight yarn to achieve the size measurements listed. Making a gauge swatch before you start should help. -This hat is primarily crocheted using the Seed Stitch. Every round you make, except for the ribbing, will alternate dc, and sc sts. The non-increase rounds will stack dc on top of sc and vice versa, but the increase rounds will not. Keep alternating anyway. -Size can be adjusted down slightly by using a 5mm (H) hook if these sizes are not quite the right fit. -Optional Finishing details: Earflaps/Ties, or faux fur pom-pom are listed at the end of the pattern. Your hat should measure at least 8 1/2” long by this point. If not, feel free to repeat round 26 again. Fasten off, and then weave in ends. Earflaps (you’ll need to make two) – Position them on opposite sides of the hat starting on final round of sc sts right after finishing final rib. Cut 9, 2 ft lengths of yarn for each tie, thread them through the bottom of the earflaps, and braid. Fasten off with a piece of yarn wound around the bottom section of the braid. Click here and scroll down the page to view a short picture tutorial on making a faux fur pom-pom. Use a 5″ circle for the hat’s pom-pom. Follow Me and Get Updates! Friends, if you enjoyed this pattern, then don’t forget to sign up for my newsletter! That way you’ll never miss out on special events, or freebies I’m offering. Sharing a link to this post with your friends is also always appreciated! You are welcome to share the link to this pattern, using one image of your choice, on your site. However, please do not share the written patterns themselves, or use additional images. You never have permission to use my images by themselves on Pinterest, although they may be included in a roundup pin if there are 4 or more other patterns. If you sell finished items online, then please do not use my pictures for your listings. I’m positive that your work is of high enough quality for you to sell the finished piece, so ave confidence in your abilities! <3 Thank you! Nice pattern. Thank you very much. Made it with a bulky yarn and 6.0 mm hook. Finished all the rounds in about 2 hours. Used an entire skein of Lion Brand Tweed Stripes, 144 yards. I’m glad you enjoyed making it, Lett! What size did you make? I love the feel of that yarn more than most worsted weight acrylics. Love the pattern , how would I crochet it flat to be used on a jumper please. 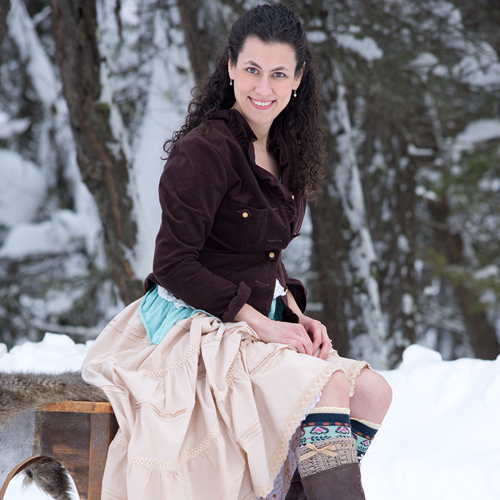 Have you released the scarf pattern yet ? No I have not. It will require quite a bit of cutting and rejoining the yarn though because of the way the hdc in the 3rd loop works. What a beautiful hat. I can’t wait to finish mine. Seems I have run in to a snag, though. I may be overlooking/overthinking but I can’t make it work out. I’m hoping you can help. I’ve arrived at round 15. Round 15 says to repeat rounds 9 through 14 one time. (This would be rounds 9, 10, 11, 12, 13, 14). This is a total of 6 rounds. I am starting at round 15. If I do six rounds, I would be finishing at the end of round 20 and ready to begin round 21. But round 21 of the pattern puts us in the middle of the next set of repeats. But that 2nd set of repeats, the pattern puts us starting back at round 20 and repeating rounds 9 through 11. Do I omit a round in the 9 through 14 round repeat to bring me to the correct number of rounds (19) or are the rounds just incorrectly numbered? The round numbers were incorrectly numbered. They have been updated! Thank you so much for your help. I am in love with this hat and can not wait to see it all finished. I’m using Red Heart Super Saver in the colorway “Grape Fizz”. The texture of the hat is making the colors just pop. What is the magic circle , is it into the chain one? I just need to clarify which is the inside/outside of the hat. When I start the magic circle and there is a tail, is this the inside of the hat? The reason I ask is because when I crochet in the 3rd loop, the raised texture is on the opposite side (not the same side as the tail from the magic circle where I started). This would mean I turn it inside out when I’m finished, which is not what I typically do. Thanks! The tail should be on the underside of the hat and you should not have to turn the hat inside out when you are finished. You may be working into the wrong side of the stitch when you come to the 3rd loop section. The 3rd loop will be at the back of the stitch, not the front when working in rounds. Thank you so much for the pattern 🙂 I started mine yesterday and probably not going to finish it for a few more days (full time job and 4 kids). I’m making this for my 2 daughters and they’re super excited! I’ll let you know how it goes. Will post the finished product pics 🙂 Thank you again for all your work! Love the look of this beanie. Can’t wait to try making it for my son and grandson. Thanks for sharing. I LOVE this hat. I would like to make some chemo hats with some thinner #3 yarn. I haven’t had to adjust a pattern for yarn before, can you help? You may be able to make womens sized hats by following the L/XL hat pattern. You can probably use the hook size I recommend in the pattern, but you may end up needing to go up a hook size if you have tight tension. I was just looking for a hat pattern to make a hat for my son for Christmas. This is going to be perfect! Making it with lion brand heartland tomorrow. Thank you!! Beautiful pattern. I have a question. What does [ mean? For example on 8 it says “ch 1, (dc, sc) in first st, [dc in next st, sc in next st] 3 times.” Does that mean to repeat (dc, sc) dc in next st, sc in next st repeat 3 times or just repeat dc in next st, sc in next st 3 times? At what round would I start if I wanted to make this a messy bun beanie? I love the look of this pattern its exactly what I was looking for the messy bun hat. Merry Christmas!! Thank you for the help. Beautiful pattern! I enjoyed making this hat. I used Caron One Pound yarn. Didn’t seem quite soft enough. I’ll try using a #5 bulky see what happens. Hi,….. I’ve finished 3 hats, one in bulky, one Caron pound, and one in I love this yarn, that one came out just a little smaller. The bulky yarn one is heavier, fits my head but I have larger head. It’s nice and warm that’s for sure! I’ll mail to my aunt in New York State. She’ll love it. I’m in CA. Just wondering what adjustments might need to be made to use a cotton thread for this hat? I would not recommend using crochet thread for this project as it is much too narrow. Your ridges should be on the outside of the hat, and you should not have to turn the hat inside out to make it work. The 3rd loop will be at the back of the stitch, not the front. Good luck! Making this hat for my mother-in-law for her birthday in January. I am loving how its turning out. I’m doing it in a hot pink with white done on the hdc in 3rd loop parts. Very easy to understand pattern. Thank you for that! Hats are not my strong points in crocheting. But your design is coming out beautifully! I’d like to know about the cute little tag showing on the hat in the photo. Can you give instruction on 1) where to find the tags, and 2) how to attach? I created this one myself but there are plenty of shops on Etsy that sell them. Look for “All This Wood”. They make wood, and leather tags in a variety of colors and sizes. The tags come with holes already punched for sewing them to the item you’re making. Hello, and like everyone else I love this pattern. I am having a bit of trouble with the fpsc/bpsc as my hook seems too big and cumbersome to execute comfortably. I read through the comments and seems no one else is having this conundrum. Please help and advise, I wanna finish my hat and make more. Stuck on round 8 of the small adult/teen. I have 56 stitches on round 7 as indicated but if I do sc/dc in 1st stitch the (sc,dc) 5 times then repeat I end up with way more than 60 at the end. Idk what I’m doing wrong. I’ve checked multiple times. Make sure you aren’t doing a sc, dc in each st. You will repeat alternating sc in one st, dc in the next 5 times for a total of 10 stitches, then do the increase (2 sts in the same st). I hope that helps! Thanks. I figured it out. Finally. The 5 times thing really threw me off. I ended up doing the math. Great! I’m glad you got it working! Fixed! Thank you for pointing that out, Tina! Maybe a dumb question, but are the stiches worked through both loops or just the back loop? I can never seem to figure out what is “standard”. Thanks! Can I also ask, should this hat fit snugly or is it kind of a slouchy hat. I made the medium adult size and it turned out way bigger than I expected. Could it have been my tension? I used the Carron yarn and all, and normally I have the opposite problem of too much tension. I just finished crocheting this hat for a student in need at my school My husband walked by and stopped to admire it. Then he requested if I would make a hat for him! Thank you for your pattern. The instructions are clear and the hat works up quickly. It’s such a beautiful pattern!! That’s awesome, Linda! I’m glad you’ve been able to get some good use out of this pattern! Hi…very silly question. You mentioned the magic ring to start, yet no number on how many stitches in the ring? I haven’t crocheted in a while but I came across this pattern and I’m going to try it (1st shot at making a hat so I have my fingers crossed). Thanks for sharing the pattern! I know I’ve commented before on this great hat, but just had to again. I’ve made about 10 of these hats. Just love this pattern and how it looks. I think it will be my go to hat pattern. Thank you once again for sharing such a wonderful pattern. I appreciate it! I know how much work it can be designing a pattern then writing it out. That’s so awesome, Dawn! You’re welcome! How can I make this into a ponytail beanie? Do you have a video with step by step for this hat? No, it is the written instructions only. What is the correct stitches? I seen in a comment that you had to update the pattern.